Electronics have advanced through continuous improvements in microprocessor technology since the 1960s. However, this process of refinement is projected to stall in the near future due to constraints imposed by the laws of physics. Some of these bottlenecks have already taken effect. For instance, the clock speeds of processors are have not exceeded a few gigahertz, or several operations per nanosecond, for the past 20 years, a limitation stemming from the electrical resistance of silicon. This has led to an increasingly urgent global search for superior alternatives to semiconductor electronics. One of the leading candidates, spintronics, is based on the idea of carrying information via the spin of electrons. Using spin currents to convey information is an exciting prospect because it involves lower energy consumption than ordinary electric currents. There are, however, numerous practical difficulties to be overcome. One of the most serious is the spin injection problem, transferring a spin current from one material to another (e.g., from a magnetic metal to a semiconductor). This tends to scramble the spins, destroying the information they carry. Now, a breakthrough in the speed and efficiency of spintronics has been achieved by a team of scientists from Nanyang Technological University (NTU), the National University of Singapore (NUS), and the Agency for Science, Technology and Research (A*STAR) in Singapore, as well as Los Alamos National Lab in the USA. 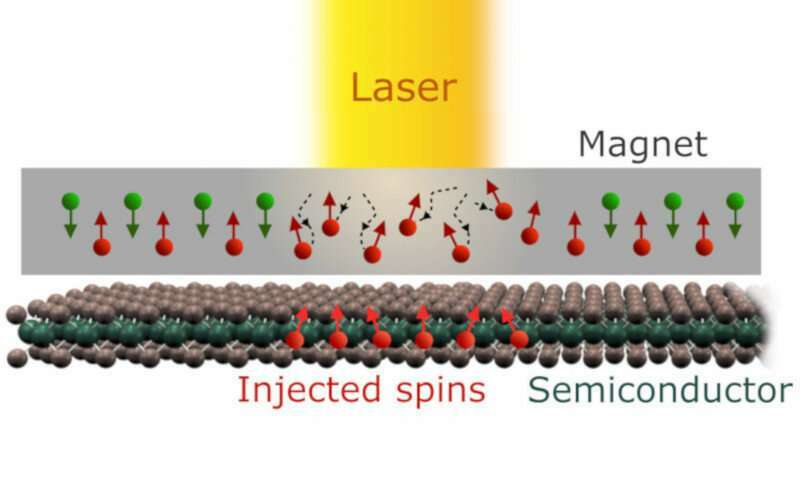 They have shown that an ultrashort pulse of spin current, lasting less than a picosecond (one trillionth of a second), can be injected from a metal to a semiconductor with amazing efficiency, breaking the previous spin injection record by over 10000 times. These findings were described in a pair of papers recently published in the leading scientific journals Nature Physics and Advanced Materials. In these experiments, ultrashort spin current pulses are produced by shining a laser pulse on cobalt, a magnetic metal. This generates a swarm of excited electrons with spin polarisation, meaning that the spins mostly point in the same direction. The spin-carrying electrons then travel outward, diffusing into other adjacent materials. "We wanted to show that these ultrashort spin current pulses can be used for efficient spin injection," says Marco Battiato, a Nanyang Assistant Professor at NTU and a member of the research team, who had advanced the first theoretical prediction of this phenomenon in 2016. He notes that the outward diffusion of spin current pulses takes place over several hundred femtoseconds (one femtosecond is one thousandth of a picosecond). This is up to 1000 times faster than conventional electronic devices, making it potentially useful for future high-speed spintronic devices. The extreme speed of the spin diffusion, though exciting, also makes the phenomenon difficult to study in experiments utilizing present-day electronic technologies. 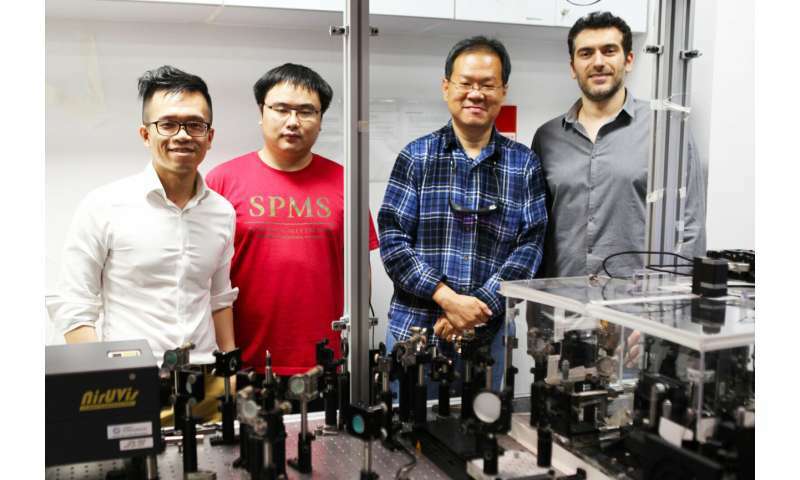 "We had to devise a careful strategy to measure the spin currents flowing into the semiconducting part of the device," says Associate Professor Elbert Chia, who supervised the experimental part of the project at NTU. "To accomplish this, we used a semiconductor containing heavy elements, which converts spin currents into ultrashort electrical currents. The entire sample then becomes an electromagnetic antenna, emitting radiation at terahertz frequencies (intermediate between microwaves and infrared light). We are able to measure this radiation, then work backwards to figure out the original spin current." By carefully selecting the materials in their spintronic device, the team was able to show conclusively that a spin-polarised current was being injected into the semiconductor. Astonishingly, the strength of this spin current turned out to be over 10,000 times larger than the previous record. "In real devices, such strong spin currents will not be required, so one can get away with considerably weaker excitations," notes Associate Professor Chia. In follow-up experiments, the authors have been able to determine how long it took for the spin current to form and decay. "Possibly the most striking aspect is that all this was demonstrated using a simple metal-semiconductor interface, without the complicated and costly structural engineering one sees in other spintronic experiments," says Nanyang Assistant Professor Justin Song, a theoretical physicist and National Research Foundation Fellow (NRFF) who was also part of the project. The samples were fabricated by the research group of Associate Professor Hyunsoo Yang in NUS. "These results represent a fundamental step in the development of ultrafast spintronics based on spin current superdiffusion," says Nanyang Assistant Professor Battiato. In the future, the team envisions this efficient spin injection process becoming one of the key technologies behind high-speed spintronic computers.